In October 2017, Minister of Interior Affairs Fatmir Xhafaj announced a “vetting” process of the entire State Police, which consisted of opening an email address to which anyone could write their “worry about anyone no matter who.” As Exit wrote back then, this letter bypassed General Directorate of the Service for Internal Issues and Complaints (ShÇBA) of the Ministry of Interior Affairs, whose legally established role it is to investigate complaints against the State Police and maintain its integrity. Employees from the Directorate of Inspection and Complaints, which falls under it, were even trained and certified by the International Criminal Investigative Training and Assistance Program (ICITAP) of the US Department of Justice. In the last few months, Minister Xhafaj’s email address has developed into a full-fledged draft law concerning “The transitory and periodical evaluation of employees of the State Police, Republican Guard, and General Directorate of the Service for Internal Issues and Complaints in the Ministry of Interior Affairs,” which will be discussed in Parliament today. The draft law, if adopted, will render the ShÇBA obsolete. Although the government is keen to surf the wave of the judicial reform and apply the seemingly “professional” and “neutral” vetting tool to the law enforcement agencies, the draft law differs at crucial points from the legislation enabling the vetting of the judiciary. Whereas the vetting law for the judiciary needed Constitutional reform and bipartisan approval for at least part of the legislative framework, the current law can be passed by the ruling Socialist Party alone. This creates the inherent risk that the vetting of the law enforcement agencies will be a cover for creating a police force that is fully subservient to the current government and its interests. The draft law proposes three evaluation organs: the External Evaluation Commission (KJV), Central Evaluation Commission (KQV), and Local Evaluation Commission (KVV). The different commissions are supposed to evaluate the different levels of the State Police, Republican Guard, and ShÇBA. This is another structural difference from the vetting institutions provided by the judicial reform, which evaluate the entire judiciary top to bottom, from Constitutional Court to secretaries. The stratification implied by the evaluation organs of the police vetting, opens the possibility that higher-level law enforcement employees will receive a different treatment from those of lower rank. The institutions that vet the judiciary were elected based on a public application process, preliminary evaluation by international observers, and parliamentary approval. By contrast, the evaluation organs of the police vetting will be selected by a Selection Board (BP) containing 5 government officials directed by Minister Fatmir Xhafaj, a former prosecutor of the communist dictatorship. The BP chooses 10 out of 5 members of the highest evaluation organ, the KJV. The criteria of the members of the KJV are even more worrying: a master’s degree, 10 years of working experience, and no political involvement for the last 3 years. Let us compare this with the qualifications necessary to be a member of the judiciary vetting institutions: a master’s degree, 15 years experience as judge, prosecutor, advocate, professor of law, civil service employee at senior level, and no political involvement for the last 10 years. By limiting the term to only 3 years, the government basically invites all party activists who campaigned for the PS in 2013 to join and vet the police. Moreover, Parliament will have no say in any of this procedure, and the election of KJV members is fully decided by the BP, in other words, by Minister Xhafaj. The KQV comprises all 15 KJV members, which also vet and elect the other 30 members from the law enforcement forces. The KVV comprises all 45 KJV members, and adds another 90 members from the law enforcement forces vetted by the KJV. The KJV, KQV, and KVV all have their own secretariats, which are supposed to compile the dossiers on all law enforcement officers. 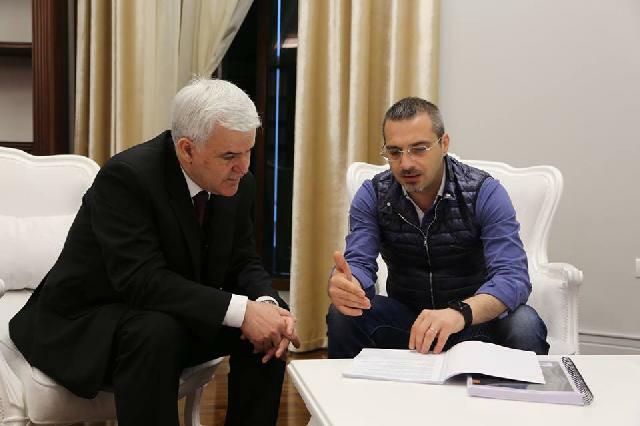 Thus, the entire structure of the evaluation organs is not based on independently operating legal professionals, but a giant bureaucratic pyramid of government-approved (“vetted”) officials, on top of which we find – Minister Xhafaj. Art. 3(4) The right to information provided for in Law ”On the right to information” may be limited by the pertinent evaluation organ if giving the information causes an evident and grave damage to the administration of the transitory evaluation process. The shocking difference is that the vetting law for judges and prosecutors includes the phrase “complying with the principle of proportionality,” whereas the police vetting draft law does not. This means that the government can refuse access to all information even only part of it would cause “an evident and grave damage.” The conscious omission of the principle of proportionality will therefore allow to withhold any information about the police vetting process from the public and the media. A final word about the actual conditions to pass the vetting – none of them are surprising or require extensive elaboration. The main problem with the draft law is the framework it sets up, and the absolute dominance of the figure of Minister Xhafaj in it. However, one of the reasons for a law enforcement officers to receive a negative evaluation is when “the employee has been photographed or has met a person involved in organized crime” (art. 36(4)(a)).